Share "Ridding Your Horse Of Thrush"
Thrush is an infection on the bottom of your horse’s hoof that affects the frog and results in black ooze coming out of the hoof with a horrendous odor. What your horse stands in is usually the leading cause of thrush. Being in bad living conditions such as a urine-soaked stall is a common source of the infection. 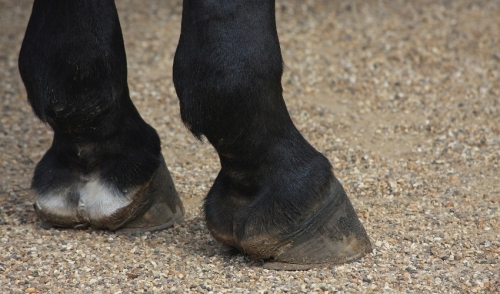 Other reasons might be when horses don’t get enough exercise, wear hoof pads or have abnormally big or small hooves. Being as that thrush gets deep into the cracks of the hoof, simply pouring thrush medicine over the hoof will not get rid of it. However, using a hoof pick and cotton ball in conjunction with that medicine will help. Wrap the cotton around the end of the hoof pick and soak the cotton with the treatment solution. Swab down the sides of the frog so you can get the solution into the cracks. Next, swab the cleft of the frog and other areas that are affected by the thrush. With this process, the cotton swabs will come out dark. Keep swabbing until the cotton looks basically the same as when you put in into the crevices. While some horses will have reoccurring thrush no matter what you do, keeping them in a clean environment never hurts. You might also consider giving them more exercise in a clean field. Just these few things can help prevent thrush from coming back.